Here you will find the various string (fiber) arts I've completed. Embroidery: Needlework decorating fabric with silk threads to add surface embellishment. Portions worked on the jacket from the Plimoth Plantation Embroiderer's Story project. (6/07-6/09) My Notes. Knitting: Using double pointed eyeless needles to manipulate loops to create a fabric. I've pretty much only made flat and round things with knitting so far. Tudor Stockings (10/08)- First attempt at socks, a pair of stockings for Plimoth Plantation's Colonial Wardrobe department. Nalbinding: Predominantly a Scandinavian fiber art of single needle netting/knitting. 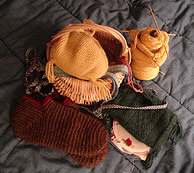 A few extant pieces have been found, mostly mittens, socks and other small fragments. Sprang: A textile creation technique that used plaiting/twining of threads stretched on a frame to make a fabric that is symmetrical on each half. So far, pictures only. Interlocking/Whipcording: Viking/Scandinavian art form for making cording. Uses bobbins wrapped with thread to make into a woven cord. Interlocking (PDF)- Here is a scanned in copy of a pamphlet given out by the Norwegian Museum. Interlocking or Making a Viking Whipcord (6/03)- Here is a handout in progress covering more details on the history, materials, and procedures. I've also done some lucet cords and finger loop braided cords, but don't have any pictures. In informal classes I called this "making big string out of little string."